I have been obsessed with watercolor paper, wet embossing, and spritzing lately! I have been having so much fun creating my own patterns and playing with techniques, sometimes it is hard to cut into them or cover any part of then up :) Well, this one was the easiest to cut into, so I started here. Take a 4"x5¼" panel of watercolor paper and sponge all over it with Night of Navy and Island Indigo. Spritz liberally with Pearlized Water (or plain water). Set aside to dry. When it was close to dry I did hit it with the heat tool, but not until all the puddles had been absorbed. 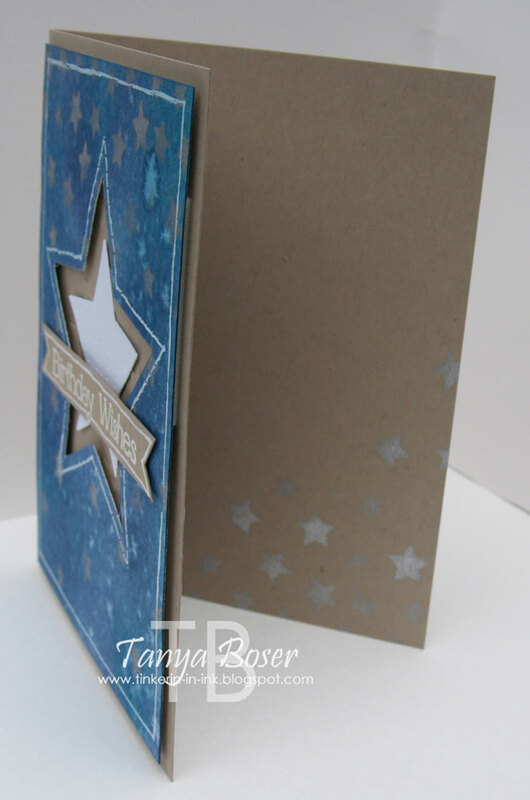 Take a 3¾" square of Crumb Cake and emboss with the Lucky Stars embossing folder. Use the Stars mask and sponge stars all over the watercolor panel with Silver Encore ink. Sponge the inside corner of the card base with stars also. Die cut a Stars framelit out of the watercolor panel. Pierce around it with the Eclectic Paper Piercing Pack, then go back with white gel pen.Outline the whole panel with white gel pen. 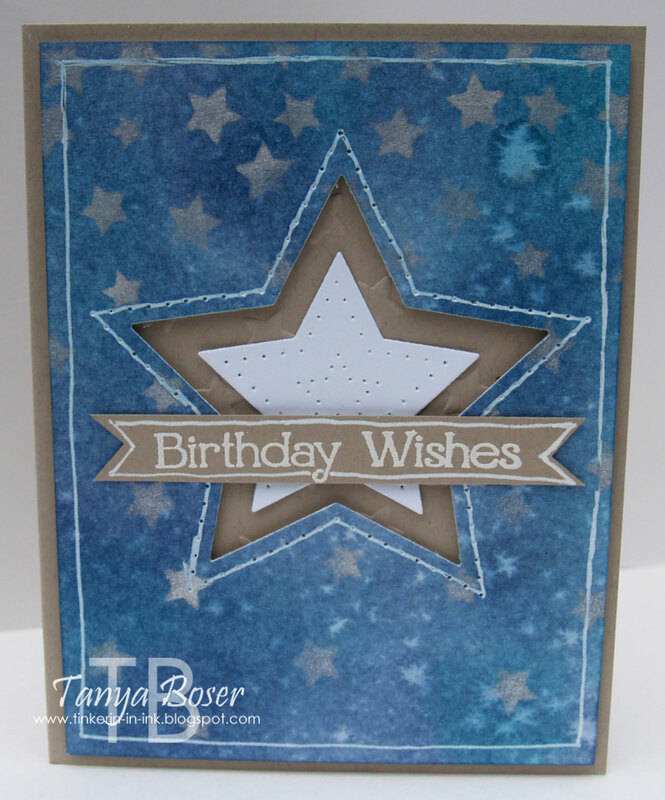 Die cut a smaller star in Whisper White, paper pierce 2 sizes of stars on it. Lay the watercolor panel on card front and trace the star on the panel, then adhere the embossed Crumb Cake panel to the card so that it will cover the star and not stick out past the edges of the watercolor panel. 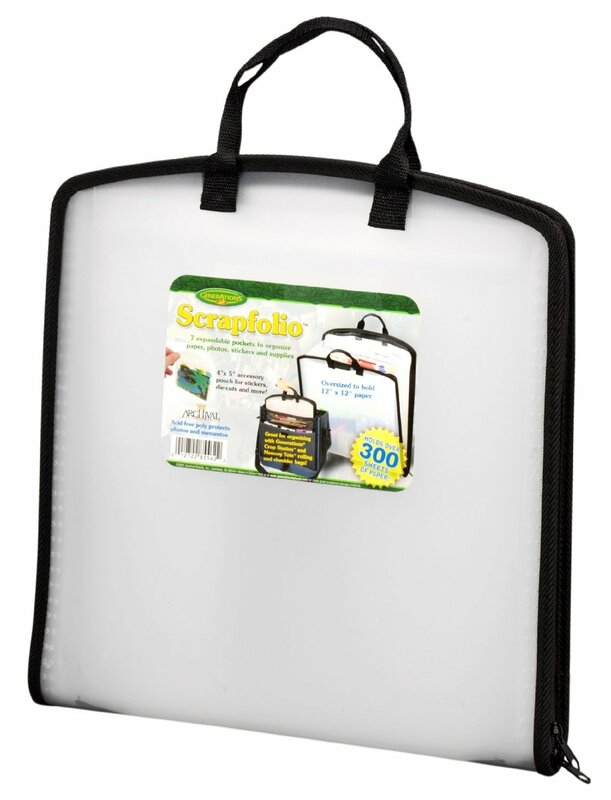 Put LOTS of dimensionals on the back of the watercolor panel and adhere to the card front. Glue the white star in the center of the star cut out. Take a ½"x4" strip of Crumb Cake and emboss with the "Birthday Wishes" sentiment in white embossing powder. Dovetail the ends with 1" Square punch. Outline with white gel pen. Adhere to the card front. 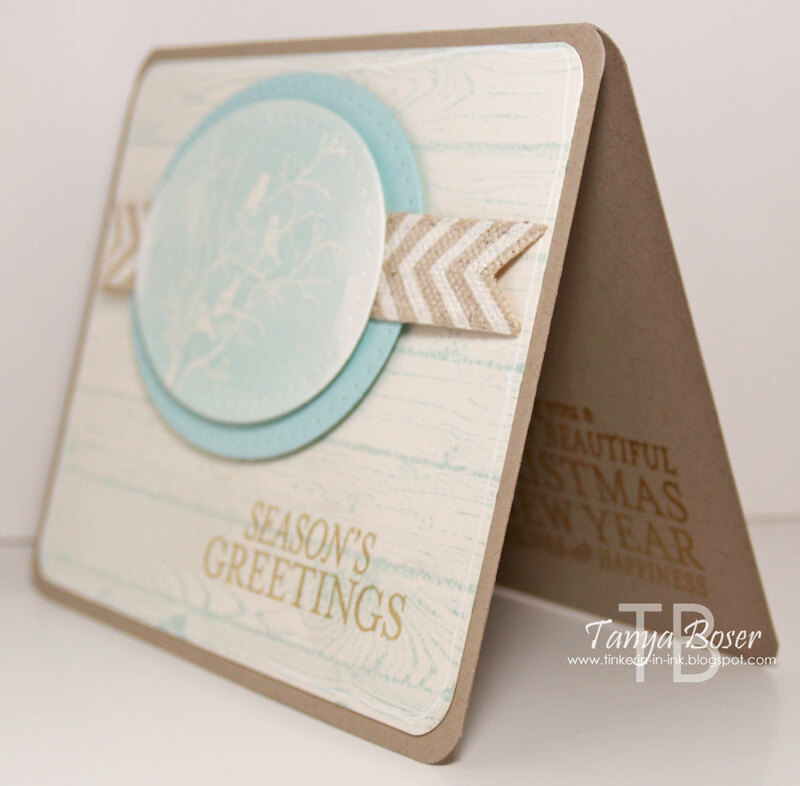 Are you ready to see a bunch of projects featuring the Winter stamps from the Holiday Mini? Well then, you are definitely in the right place! 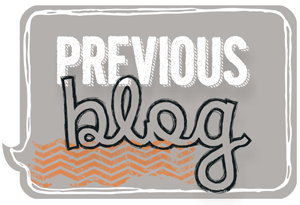 A group of us from Stampin' Addicts have come together to bring you an astounding number of ideas :) You can check out the full blog roll, and stop to chat, on the official SA thread for this hop. 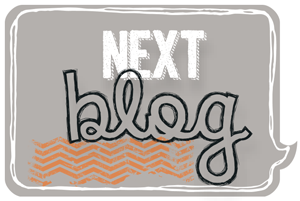 If you are following in order, then you just arrived from Debra Burgin's blog where she featured Ornamental Pine. Fantastic stuff, right?! Today, I am using the quirky, fun, adult set: Visions of Santa. I kept saying how much I like this set during the pre-order month, and then when it was time to pick our sets for this hop, I figured I better put my money where my mouth was, lol! This first card is pretty simple. I just stamped the different Santas in Early Espresso on Naturals Ivory paper and colored them with a Blender Pen and Cherry Cobbler and Mossy Meadow inks. The sentiment is stamped in Early Espresso on Cherry Cobbler and is matted on a piece of Mossy Meadow cardstock. I outlined with white gel pen, of course. This is a pretty plain jane card. I think I am going to go back and color the skin areas with Crisp Cantaloupe and add some white chalk marker to the hair and beards. That should jazz it up a bit, don't you think? 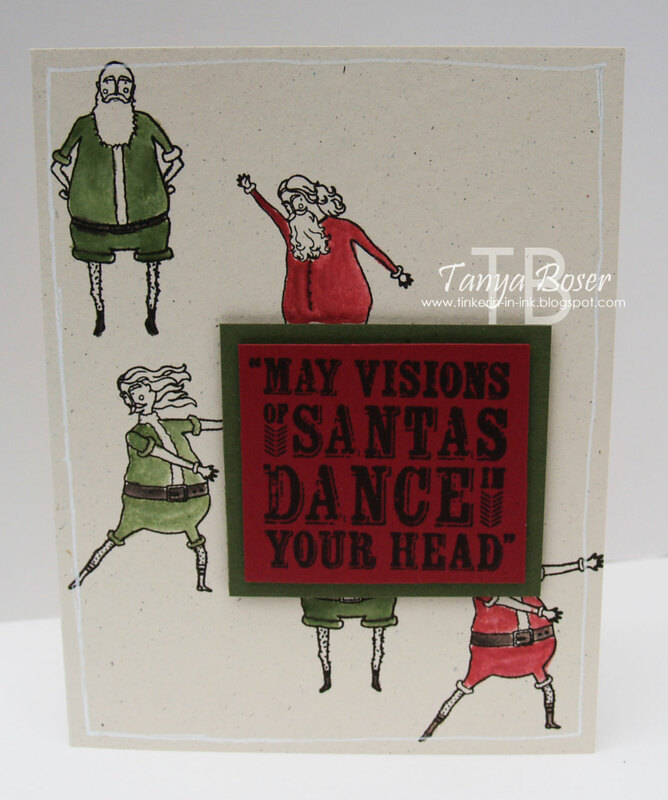 Next up is another card featuring that dancing Santa! 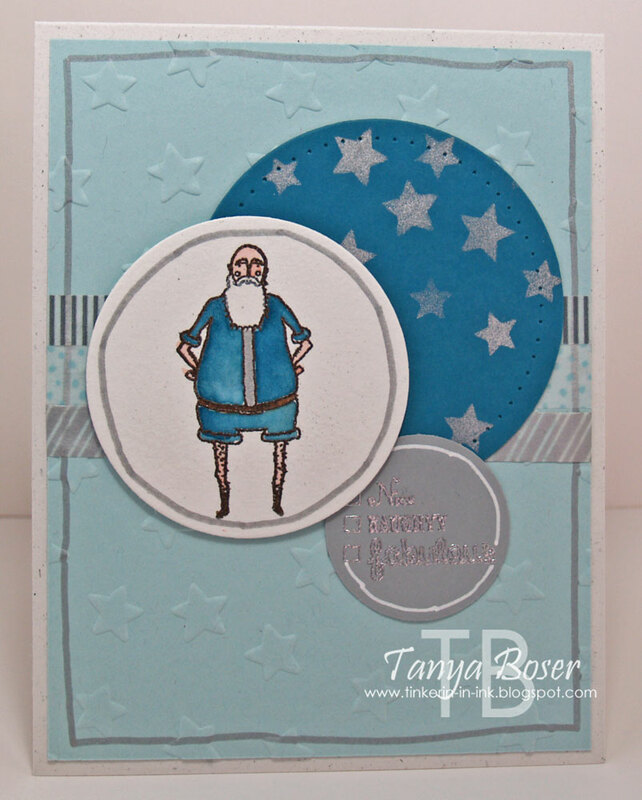 This time I decided we need to highlight Santa's star qualities ;) There are stars embossed on the Old Olive panel, the star behind Santa has one of the stars from Bright and Beautiful stamped in Gold Encore ink. Santa is embossed in Early Espresso on watercolor paper, then colored with an Aquapainter and Old Olive and Crisp Cantaloupe ink. I colored his hair and beard with the Chalk marker too. 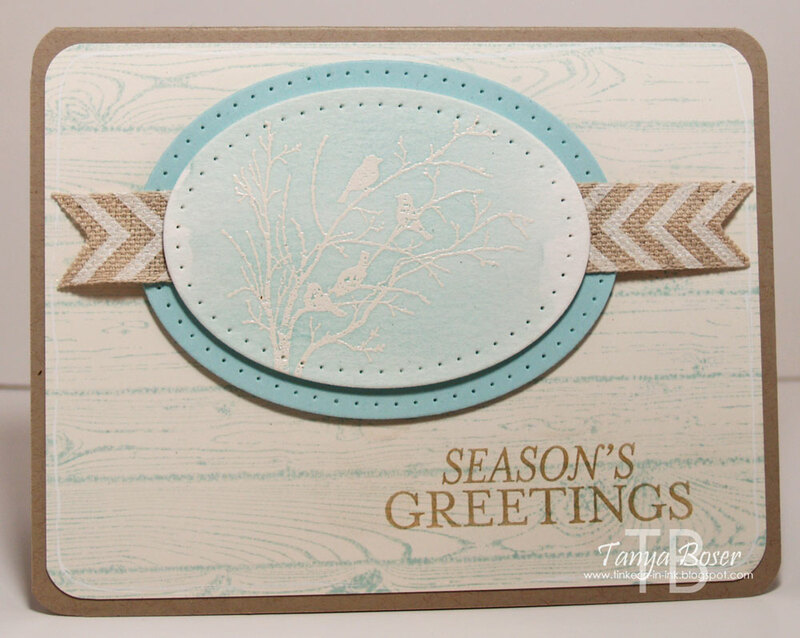 The sentiment is from Good Greetings and is stamped on a scrap of watercolor paper with Gold Encore ink also. This time I featured the moose, again on watercolor paper, embossed with Early Espresso, and watercolored with Soft Suede, Sahara Sand, and Cherry Cobbler. The Old Olive panel is embossed with the On Point embossing folder, which looks like trees to me :) The coordinating Washi tape looks fab on this card, and the Gold Bakers Twine has a few knots tied in it to give some more interest. 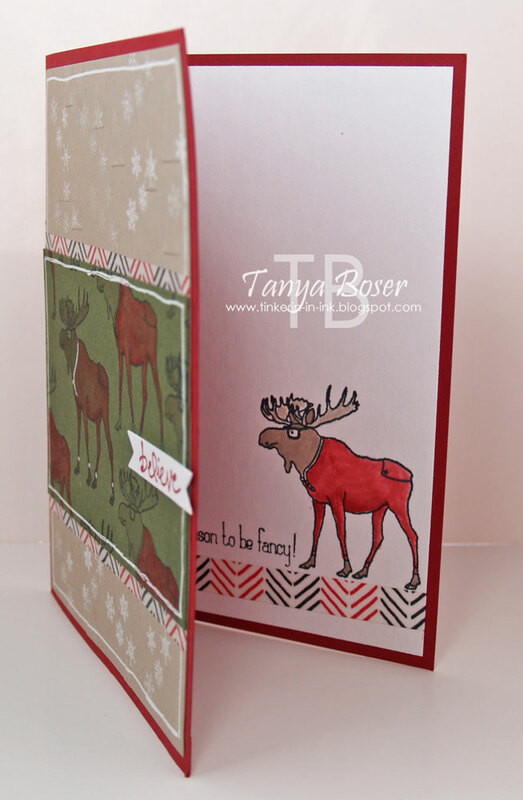 Here is another moose card. I think I like the other one better, but it isn't horrible, lol! 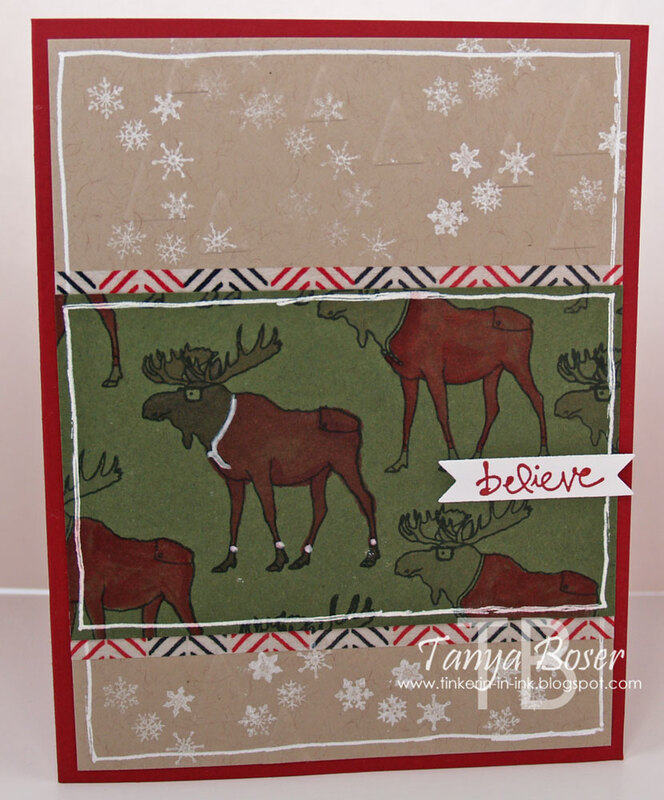 I stamped the moose several times in Tuxedo Black ink on Mossy Meadow cardstock, then used a blender pen to color some, and Blendas to color the one with the white accents. I have to admit, it was much easier to color this on the watercolor paper and with the image embossed. The Crumb Cake panel is embossed with On Point again, and stamped with the snow flurry image from this set. The Washi tape makes a great addition above and below the Mossy meadow. And I did another moose on the inside, colored with Blender pens. More Washi, and the "Tis the season to be fancy" sentiment. This particular Santa makes me think of the "dad" or "mom" look. You know the one. The one that will make you tell all your secrets. And I think it goes perfectly with the Nice, Naughty, or Fabulous check list. It is like he is daring you to be truthful, lol! More stars here, and more Washi, and apparently I am into embossing right now. LOVE the silver sponged stars from the Hearts and Stars Decorative Masks! You can see the little check list much better in real life, and it is embossed in silver. This Santa is watercolored in Island Indigo, and the fur trim down his shirt front is the Silver Dazzle marker. OK, I know that was a whole bunch of cards, but I hope you found at least one that you liked, and that I convinced you that this is not the "creapy Santa" set, but the "fun and quirky" Santa set! Now it is time to go on over to Rhonda Griffin's blog to see what she has dreamed up with Get Your Santa On! Happy October! 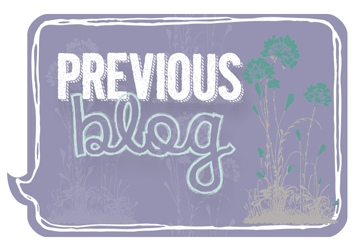 We are back to review another stamp set from the Stampin' Up! Annual Catalog. 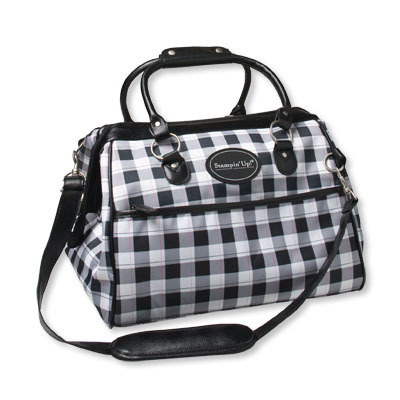 This set just came out this spring, and there are so many ways to use it! I have 3 cards for you today, and I think I used this set differently than you have seen it used a lot. For this card, I used the heart and the long streak stamps. I must have been in a hearts and rainbows mood :) The colorful strip is watercolor paper that I stamped a rainbow of streaks, then spritzed with water. Then I used the heat tool to dry it quickly and restamped the rainbow streaks again. This gave the strip lots of fun color with depth. 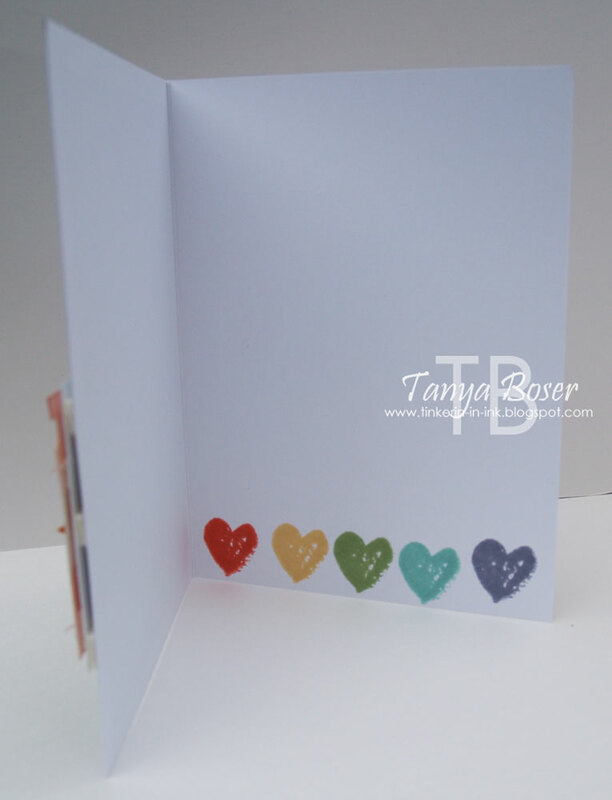 The hearts are stamped on Pool Party cardstock with Versamark and then Pearl Perfect Pearls was brushed on. I colored the rhinestones with Blendabilities markers. 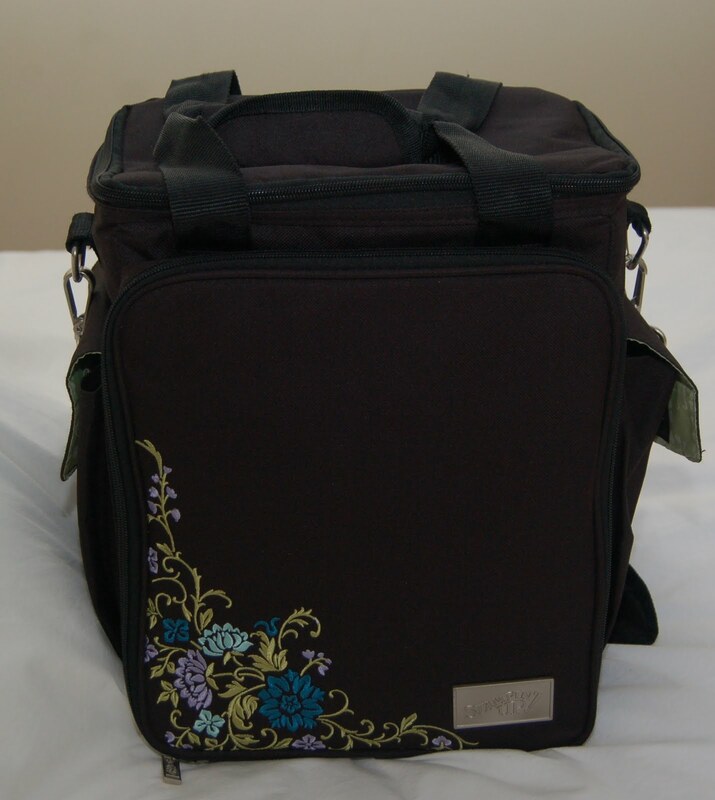 I love that I can color my embellishments to match this way! I had an extra piece of this DSP that I made with MDS. I printed one of the patterns from Back to Black onto a 12x12 piece of Crumb Cake cardstock, then cut it into 6 card fronts. I used the other card fronts on a series of cards featured in these posts: Thank You Lines, Fruitwood Birthday, Sponged Fruit Hello, and Dappled Fruit. For this card, I just stamped over the DSP with several colors and the long streak image. I must have a thing for that image, I sure used it a lot! I then stamped the "thank" and "you" images from the Work of Art set in 2 colors and then punched it out with the 1-3/8" Circle punch. The other 2 circles are from the Circles framelits. More coloring with Blendabilities on rhinestones to add just the perfect touch. I know they look like pearls on the photo but they really are rhinestones. It must be a trick of the lighting. I added a row of dots down the side of the inside panel, and the "so much" image from Another Thank You. My last card I actually used as a wedding card this weekend, so glad I had it on hand! Lots of images from this set got used on this card. I cut out a piece of Strawberry Slush cardstock with the large label from Apothecary Accents framelits, then used Generational stamping with the long streak stamp (again!) in Strawberry Slush ink, and filled in between with the retired Illuminate ink (I love it so much, I bought 2 ink refills for this ink pad). Then I pierced around the label with the coordinating Paper Piercing Pack, and outlined with the white gel pen. I punched out a few Whisper White hearts and stamped them with the chevron, the circle, and the smaller paint swoosh images in Strawberry Slush and Crumb Cake-again with the generational stamping. I outlined the hearts with a Basic Black marker to make them pop a bit more. 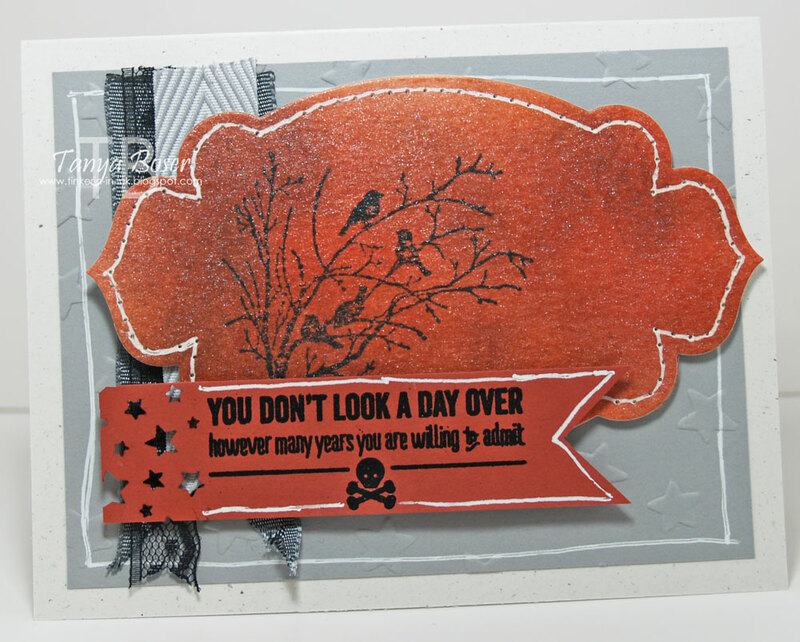 I stamped "Happy Together" from And Many More in black ink on the center heart. Then I decided I needed a couple of little burlap hears, so I took a 3" piece of Burlap ribbon and covered the back with Sticky Strip, then die-cut 2 of the smallest hearts from the Hearts framelits. This time I colored some pearls with the Blendas, so pretty! 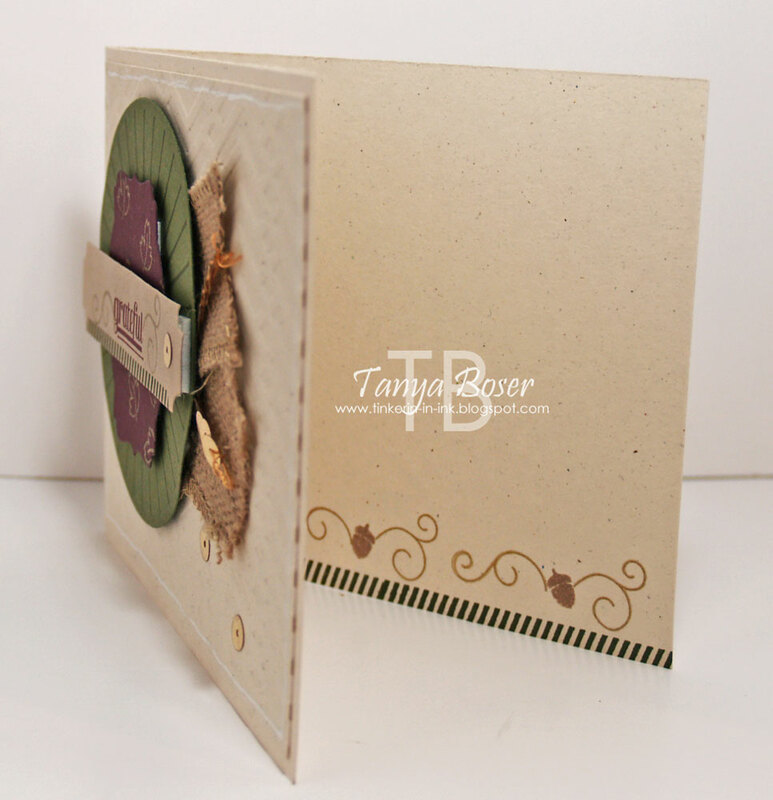 The Crumb Cake panel is embossed with the Arrows embossing folder, and the card base and the Crumb Cake panel have the corners rounded. All of the elements are popped up on dimensionals. Inside there is more outlining with the black marker, and some more generational stamping with the long streak stamp and Strawberry Slush ink. That's it for me! 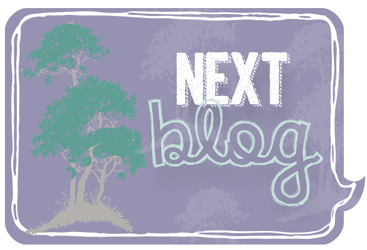 It's time to go check out what Ann Schach has created. She is a genius! !